High tech cars react to codes you place on the road! Comes with one toll booth, one stop sign and one parking lot! Also includes one police car and red sports car. Batteries included…. This toy costs approximately £29.99 (for the latest and best prices make sure you check our retailer list for the Tagamoto Enforcer Road Set above). 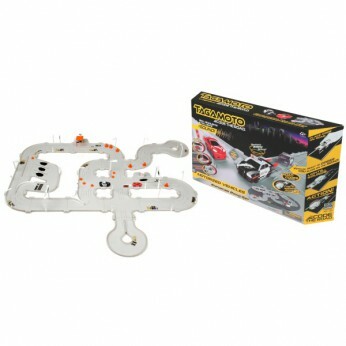 In our review of Tagamoto Enforcer Road Set we classed it as being suitable for ages 4 years, 5 years, 6 years, 7 years but recommend you check the manufacturer specific advice before purchasing.